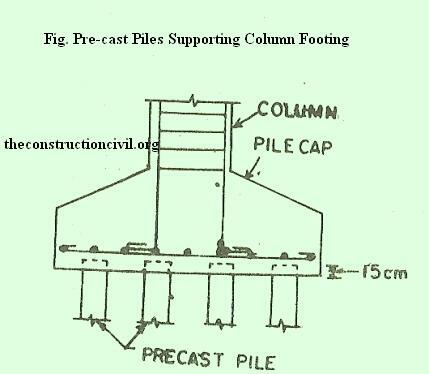 Precast Concrete Piles may be defined as a reinforced concrete pile which is moulded in circular, square, rectangular or octagonal form. The precast concrete piles are cast and cured in a casting yard and then transported to the site for driving. 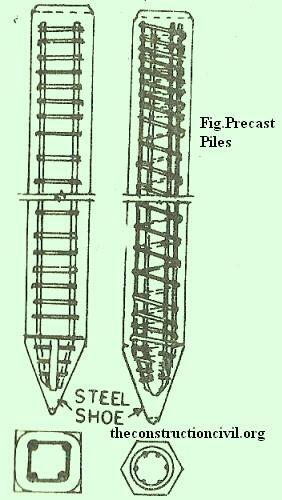 In case space is available, pile can also be cast and cured near the site of works. They are driven in a similar manner as timber piles with the help of pile drivers. The diameter of the pile normally varies 1mm 35 cm to 65 cm and their length varies from 45 in to 30 m.
The function of reinforcement in a precast concrete piles are to resist the stresses produced on account of its handling, driving and the loading which the pile is finally expected to receive. 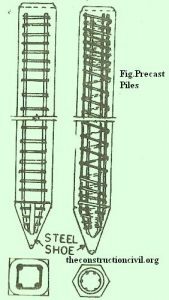 Longitudinal reinforcement usually consists of one bar 20 mm to 50 mm in diameter at each angle of the section of the pile. The vertical rods are tied horizontally by bars 6 mm to 10mm in diameter. The horizontal bars may be provided in the form of stirrups wound around the verticals. For lengths of approximately 90 cm at head and toes, the spacing of the stirrups should be 8 cm c/c. Circular piles are seldom tapered but when tapering of the piles becomes necessary due to site conditions, their length is restricted to 12 m.